Polls show that more than 70% of the French... expect that France will become a country under submission to Islam. Last month, between April 18-21, the Union of Islamic Organizations of France [UOIF], the French branch of the European Council for Fatwa and Research (presided over by Yusuf al Qaradawi) held its thirty-first annual conference in Le Bourget, north of Paris. As usual, jihadist and anti-Semitic books, which are banned in French bookstores but tolerated there, were offered in several booths. As usual also, speakers were invited to deliver fiery speeches. In 2012, the keynote speaker was supposed to be Qaradawi himself, but faced with protests from the Jewish community, France denied Qaradawi a visa to enter French territory, and he was replaced by Tariq Ramadan, a Muslim Brotherhood operative who works with Qaradawi in Doha, Qatar, at the Center for Islamic Legislation and Ethics. Tariq Ramadan was again the keynote speaker in 2013. This year, Tariq gave way to his brother, Hani, Director of the Islamic Center of Geneva, founded in 1961 by their father, Said Ramadan, son-in-law and senior disciple of Hassan al Banna, who founded the Muslim Brotherhood. If Tariq Ramadan knows how to hide his extremism, his brother is more explicit and direct. His speech was devoted to "global threats" facing Islam; he described them as having a single source: "the Jews and Zionist barbarism," an octopus "hiding in the shadows," a "power that holds the global finance and the media." He called on young French Muslims to "fight for Islam" and to go to Syria, where several hundred French youths have already joined jihadist groups. If UOIF had only a marginal influence, such statements would be already worrying. But UOIF is the leading French Muslim organization, and Hani Ramadan's speech, like Tariq Ramadan's speeches in 2012 and 2013, was listened to by an audience of 150,000 enthusiastic people, and viewed by hundred of thousands of others on UOIF-TV, the digital television channel established by the UOIF. More than 8,000,000 Muslims live in France, most of whom are French citizens, and the Muslim population in France continues to grow. France is now the main Muslim country in Europe. Successive French governments can decide to expel a Muslim preacher or a recruiter of jihadist fighters; they can deny visas, but they seem unable to do more. Although the French government denies it, it seems clear that substantial ransoms were paid to Islamist groups for the release of French hostages: $28,000,000 to al Qaeda in Niger in October 2013 and $18,000,000 to Islamic State in Iraq and the Levant in Syria, on April 19. The creation, on April 25, by French Interior Minister Bernard Cazeneuve, of a counseling center, website and telephone hotline to "advise" parents whose children are in the process of radicalization seems almost ridiculous. Entire neighborhoods are controlled by Islamist preachers and Bernard Cazeneuve knows it: officially, administrative authorities call these neighborhoods "Sensitive Urban Zones," presumably because at any time they can explode. Unofficially, the police call them "Sharia Zones", and have been ordered by the Department of the Interior to keep out. Political leaders of all parties know that most elections cannot be won if the Muslim vote is neglected, and the leaders of the National Front are no exception: Marine Le Pen has long ceased to incriminate Islam and now attacks "crime" and "immigration" without providing details. 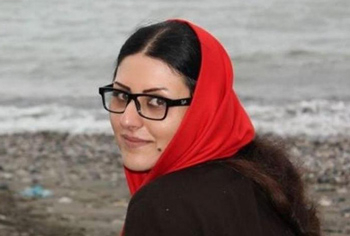 Sometimes she may denounce "calls to jihad" and "fundamentalism", but takes care not to go beyond that. Although she criticizes Qatar or Saudi Arabia, she says that France should become an "ally" of the Islamic Republic of Iran, and asks her "fellow Muslims" to join her fight against "American globalism and its Islamist allies". A "Collective Against Islamophobia in France" is gaining ground: it handles complaints against any critical remarks about Islam, and it can rely on the courts to punish offenders. A "League of Judicial Defense of Muslims" was also created in 2013 by Karim Achoui, a lawyer disbarred because of his links with organized crime. 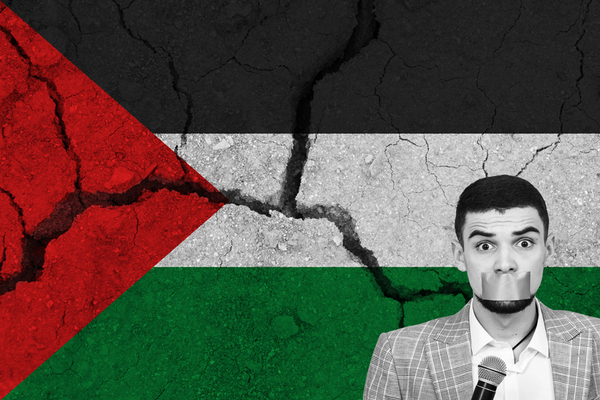 No anti-racist organization dares denounce Muslim anti-Semitism, and none of them criticizes speeches such as the one given by Hani Ramadan in Le Bourget. Jewish institutions do not denounce Muslim anti-Semitism, either: they speak of an "unhealthy climate". When, on April 28, during a tribute ceremony to the Jews deported from France to Auschwitz, Arno Klarsfeld, a member of the Council of State and son of Nazi hunters Serge and Beate Klarsfeld, said that "some of the suburban youth are anti-Semitic," he was immediately summoned to appear before a judge. NGOs fighting the Islamization of France are now marginalized. Their leaders are persecuted by the justice system and severely punished. The mainstream media demonize them. The main one, Riposte Laique, organized a demonstration on March 9. About four hundred people came. Three or four years ago, Riposte Laique could gather several thousand people. The anti-Semitic and pro-Islamic standup comedian Dieudonné continues to give performances to packed theaters. On June 21, he will host a ceremony to honor people who posed with the best "quenelles" -- the inverted Nazi salute he invented. More than ten thousand tickets have already been sold. On his website, Dieudosphere.com, pictures of "quenelles" are still present. 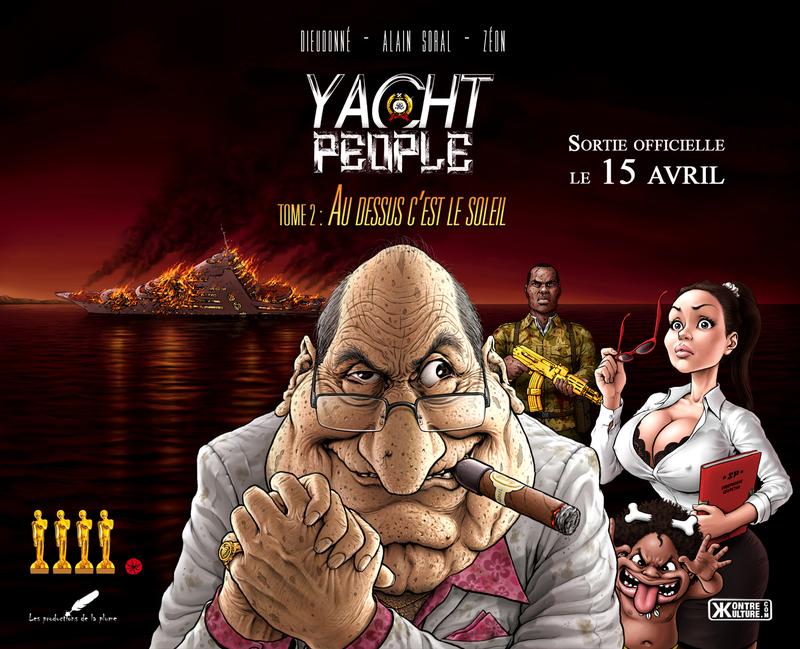 Dieudosphere.com sells a comic book called Yacht People. The cover shows a fat rich man with a hooked nose rubbing his hands together and flashing a greedy smile. The resemblance to the caricatures of Jews published during the Nazi era is evident. Manuel Valls fought Dieudonné when he was Interior minister. Since he became Prime Minister, fighting Dieudonné is no longer one of his priorities. During an interview with Alexandre Arcady, the director of Twenty Four Days, a film about the assassination seven years ago of Ilan Halimi, a young French Jew who was taken hostage and killed by young Muslims from Paris suburbs, TV journalist Aymeric Caron tried to explain that the growth of anti-Jewish hatred in France was logical because "Israeli soldiers kill Palestinian children." These remarks did not offend anyone except a few Jewish journalists, so they were cut from the edited version of the show. Aymeric Caron explained that he was not an anti-Semite, but only "anti-Zionist." He has recently published a book called, Incorrect: in which almost all his targets have one thing in common: They are Jews. He is invited onto many talk shows to speak about his book. Whoever looks for books about Israel will easily find books called Israel, the New Apartheid or The Invention of the Land of Israel, by Shlomo Sand. Books offering less-biased viewpoints are unavailable. Dozens of books by Tariq Ramadan are on the shelves of all main bookstores. The number of Jews leaving France is steadily increasing. French people who have the financial means also leave the country. Most others expect the worst. Polls show that the French are now the most pessimistic people in Europe. They also show that more than 70% of the French are afraid of the rise of Islam in France: they expect that France will become a country under submission to Islam. What a bunch of cowards, are you going to allow a bunch of misfits to take over your country. My ancestors are from France and I have to say I would be ashamed to call myself French if you allow this to happen. When I started reading the article, I wasn't convinced that France would become a country submitted to Islam. I am now. And I believe it will happen sooner rather than later, since I expect a mass conversion to Islam by the native French. It is plain and simple. The Arabs are the new Nazis...simple. The French cooperated with the Nazis in WW2 and now they are doing the same with Islamists. I guess a zebra doesn't change its stripes. He must get what it coming to him. That is new French identity! Traitors and socialists. You deserve Islamic conquest. Before it happens you should destroy all atomic weapons and technology. I was surprised and sickened by this piece. Next year I was hoping to take a trip to the "city of light." Forget it! Any country which allows its citizens to lie or degrade others of another faith is wrong! There are too many in France who do not agree with me, especially in government. If they do agree with me, they are too cowardly to do anything about it. Of course, France was never known for its righteous attitude toward Jews. The problem of bigotry is not just a problem in France, there is plenty in America. However, I think that those who have not stood up against people who are anti-Semitic (or other faith) are cowards, unless, unfortunately, they also are bigots. A short time ago, Dieudonne was being put on trial and refused an outlet for his antisemitic performance. Now he's a hero. How did this happen so quickly? Fecklessness in a nation that capitulated to the Nazis, even setting up their own Nazi government, now capitulates to the newest form of antisemitism. The French are glamorous, but they have no character. People think Islam will last because it's a religion. If Islam continues as an excuse to hate the Jews, they will go the way of the Nazis who lasted much less than the 1,000 years they hoped for. G-d doesn't like people who hate the Jews. I used to be proud of my French ancestry but no more. The Muslims will take over France but they will never destroy the Jews, God's chosen people. This man forgot to mention that the Mosques and schools teach that Jews are monkeys that eat blood. Absolute lies. They have no intention of making peace with the Jews, all you have to do is look at the PLO Manifesto. They train their children to die and confront Jews. You never see Jewish children throwing stones. It appears to me they are being encouraged to do it or otherwise they have no discipline. Ignorance is the mother of all evil. However, Islamists are doing a great job at Public Relations. Why are France, England and other European countries not banding together to arrest this cancer and get tough on immigration laws? It's a numbers game. They have the numbers, but if Europe unites you'll have the numbers too. The hand writing is on the wall. The anti-Jewish propaganda (Anti-Semitism)is just the beginning. Next will be those who refuse to convert. I cannot believe that my beautiful country is this stupid. We are Christians and should stay that way, not go around killing innocent people just because they don't want to be Islamic. I'm truly sorry for France and glad I left it. It confirms my suspicion that Muslim violence will be the main instrument to sift the Jews from the nations, as in Jeremiah 30:11. If the day ever arrives when the Muslims control France, it will be the dawning of a new Dark Age in Europe. Will the French nation cave in as they did in 1940, knowing what the Muslims intend to do? They already see it in many parts of the country, where only Muslims can go in safety, and this is spreading all over many other countries in Europe. We in England are not safe from this problem. The Muslim population is growing at an alarming rate and no doubt will continue. Can anyone doubt that the Muslim immigration is designed to consume the nation they enter into and replace it with an Islamic country which will destroy the existing culture, religious beliefs, freedom, history, art and even structures to be replaced by mosques, Sharia law and Islamic supremacy? Maybe the French are Dhimmis at heart rather than being courageous and brave enough to stand up to Muslims and Islam and defend their culture and freedoms. Do they want to be French or Muslims? Europeans depress me. DownUnder is no such violence against civilisation, yet in Europe [France] they allow this theocratic fascism to blossom. Can't they remember what happened in '36? In the interbellum period of 20th century Mein Kampf wasn't taken seriously and now we know what fascism can do, or maybe not? Muslim countries such as Turkey, Egypt, and Syria and the Palestinian Mandate supported the Nazi ideology and after the war they granted asylum to Nazi war criminals, like other fascist regimes in South America did. And now their Muslim ideology has been exported to us, an aggressive form of fascism re-entered Europe and the average well educated Europeans look at their leaders with great concern wondering why these leaders refuse to read the Quran in which is described why and how we'll be deprived of dearly won things such as equal rights for women and men under the law, freedom of speech, etc. It seems like the leading class in Europe hasn't the courage to defend their own heritage and the people they represent and is blind to the fact they will be subject to ideological pressure, and very probably not as the last ones. The way it is done can be seen in the Middle East, Asia and Africa according the rules of the book . From the article: "Dieudosphere.com sells a comic book called Yacht People. The cover shows a fat rich man with a hooked nose rubbing his hands together and flashing a greedy smile. The resemblance to the caricatures of Jews published during the Nazi era is evident." Actually, there is further proof in the image itself, If one clicks again on the image in order to magnify it, one can see the image of a Menorah on the ring that the character in question is wearing. If this article doesn't spell the end of France, frankly I don't know what does. It seems to me that this is France's last chance to do something to save their culture. Ten to twenty years from now, it'll be unrecognizable there. Eight million Muslims in France? Wow. Take a lesson from Quebec, eh.